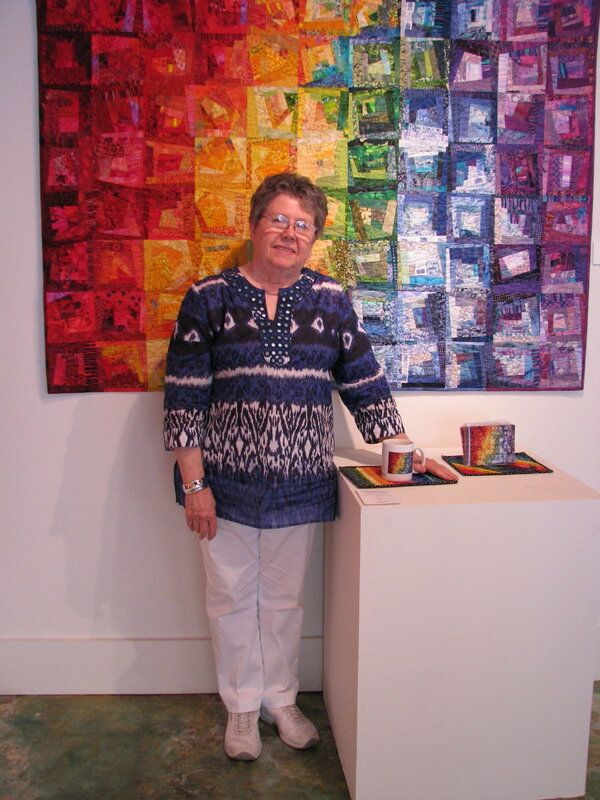 Creativity, curiosity and passion drive Wanda S. Hanson to experiment in her favorite art medium - Quilting. Using traditional, modern and original quilt designs, she expands your thinking of how color, pattern and form can be successfully arranged. Wanda is a pioneer from the early blogging days, since 2007 Exuberant Color has included DAILY posts of her creations. It's not very often that you're able to have an inside view of an artist's studio, daily creative process, and connect with them personally. Wanda loves the community that blogging creates while staying actively focused on her craft. We're excited to roll out an updated blog with all of her original posts and bring together all of Wanda's offerings in one simple website. Follow along with the Exuberant Color daily blog! Wanda creates quilts like artists of other mediums – in series or bodies of work. This exhibit in North Carolina is a good example of how many pieces Wanda creates within one pattern as she challenges the status quo and learns and experiments. Many quilt patterns in this exhibit are Wanda's original designs. Tour the exhibit with Wanda! Speaking to Quilt Guilds since 1987, teaching classes since 1975, Wanda has a plethora of knowledge not only from her over 50 years of quilt making, but also from her foundational sewing experience. Beginning as a sample maker for a fashion designer, she moved on to years as an entrepreneur making custom clothing, home and decor items. Her understanding of the best construction techniques combined with her creativity and mastery of color make her classes rich, empowering experiences. Learn how to master color in Wanda’s Online Course COLORWASH 360. Spring Enrollment has closed. Subscribe to be notified next time it’s offered. Get Free Resources, Early Access to all new release works, kits...in the Exuberant Color Pop-Up Shop. Keep up with the latest offerings from Quiltmaker and Teacher, Wanda S. Hanson. All emails include an unsubscribe link, you may opt-out at any time. We respect your privacy.